What can I do if the TP-Link Wireless Adapter is not achieving desired speed? When using a wireless adapter, the wireless speed is not achieving desired speed. There are many factors that can affect the speed and connection of a wireless adapter, but there are also several solutions that can be tried. 1) Adjust the location of the adapter. Sometimes, moving closer to the main router,or changing your position in the room, can affect signal strength and wireless speeds. 2) Get rid of obstacles. If your router is inside a cabinet or otherwise obstructed, or if there are significant obstacles between the router and the device you are using with the adapter, try moving away these obstructions to improve your signal strength. Ⅱ. Slow connection speed will affect the internet speed. On your computer, please right click Wireless Network Connection, click on Status, and check what the connection speed is. 1) Check the wireless mode on the wireless router.Make sure it is on 11n mode or 11b/g/n mixed mode, rather than 11b or 11g mode.11b mode will only have a maximum 11Mbps connection speed, 11g has 54Mbps. 2) Check the wireless security encryption of your router. Security encryption of a wireless network greatly affects the speed of the connection. Make sure your router is configured to use the correct security encryption so that you can maximize the speed your router is capable of. Usually it is suggested to use WPA/WPA2. 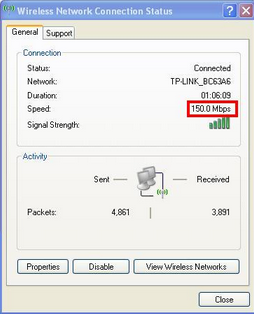 3) Check the wireless channel and channel bandwidth of your router. Different channels will have different performance.The more crowded the channel is, the poorer performance it will get.Channel Bandwidth is also important to the wireless connection, make sure it is set to the best value for your router. Ⅲ. Cause of Router’s firmware or adapter’s driver. Check for the latest updates and drivers for your devices. Make sure your router is running the latest firmware, as this will ensure a better performance and reliability. Please also update the wireless adapter’s driver to the latest. Ⅳ.Cause of the Computer itself. If after all above steps, the speed is still slow.It is better to test the wireless adapter on another computer and see how it works. Please feel free to contact us at support@tp-link.com for further problems.